A busy road in Riverview that turns into a daily parking lot could see more people coming to the area as there's a proposed apartment complex in the area. RIVERVIEW, Fla. -- A failing road in Hillsborough County is the reason why county commissioners voted to delay approving an apartment complex in a growing area in Riverview. 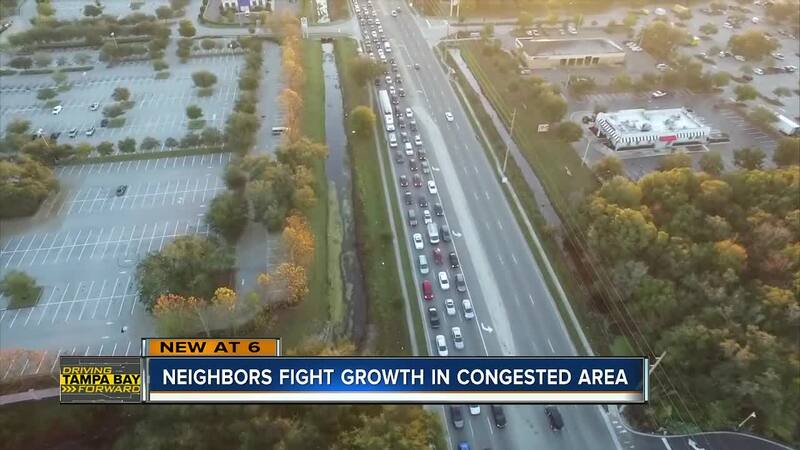 Bloomingdale Avenue turns into a daily parking lot during the morning and evening rush hour in the south part of Hillsborough County, that connects to US 301. On Thursday, developers went to county commissioners in their first step of the application process in a proposal to add a nearly 300 unit apartment complex between Gornto Lake and Simpson Roads. However, during the county commission meeting, they decided to delay a vote citing concerns over the road being rated as a grade F.
"We have already six pounds of potatoes in this five pound potato bag," said Commissioners Mariella Smith, "we can't add more potatoes." Commissioners Pat Kemp and Kimberly Overman both spoke up about their concerns on the road they say is unsafe and too congested. Bloomingdale Avenue has consistently been on the county's top five most dangerous roads with dangerous intersections like Gornto Lake and Providence Roads. Commissioner Smith added that their isn't adequate capacity and there's nothing in the immediate plans to fix the already gridlocked road. Transportation leaders with Plan Hillsborough have studied the congestion along Bloomingdale Avenue for years, including a comprehensive study in 2017 where they proposed adding a reversible lane. The idea was later axed as businesses, and others worried about the impact of taking away left-hand turns up and down the long stretch of road. ABC Action News requested from Hillsborough County officials how many developments are going up or planned to go in along a six-mile stretch of Bloomingdale Avenue between US 301 and Lithia Pinecrest Road. However, we were told that data was not available because the data is not easily accessible, nor do they have a visual mapping out the growth to see what's being built. Plan Hillsborough has no immediate plans to directly change the construction of Bloomingdale Avenue like adding more lanes because of businesses along the roadway and people's properties. However, they're looking at ways to relieve congestion off Bloomingdale by fixing surrounding routes like Lumsden Road for example. Another option would be to widen Lithia Pinecrest between Bloomingdale and Lumsden to alleviate congestion along Bloomingdale. Commissioner Stacy White brought up in Thursday's meeting that maybe the idea of the reversible lane, or a fifth lane should be revisited. Note: Spoto High School does not have adequate capacity for the proposed development. An attendance boundary change may have to be conducted in order to accommodate additional proposed growth. The first step in this proposal will take place on Thursday before the board of county commissioners at 6 p.m.
A public hearing will be held in April.